The dust is finally settling on the hugely successful 2013 EFG London Jazz Festival – thanks to all who supported the three SECollective nights that we put on last week, we really couldn’t have done it without you! Thanks must also go to all the musicians that joined us in making it such a wonderful celebration of our local scene; the future is indeed bright! And so the show must go on – and thankfully we’ve saved a little post-festival treat for you! This Tuesday evening (TOMORROW!) 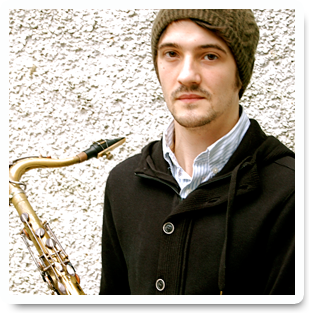 we are delighted to be welcoming one of London’s finest upcoming saxophonists: George Crowley – who will be ably supported by some of the most in demand creative players in Britain. Come and check it out! A newish project from saxophonist and composer Crowley, this quintet play original music with an emphasis on open, interactive improvising and fun, influenced by a range of things from doleful drunken blues to taught, frenetic grooves. Completed by the brilliant and individual musical personalities of Tom Challenger (Outhouse, Brass Mask), Dan Nicholls (Strobes, Nostalgia 77, Zhenya Strigalev / Eric Harland), Sam Lasserson (Jeff Williams, Martin Speake) and on this occasion Dave Smith (Outhouse, Cloudmakers, Robert Plant) this band promises to bring an immersive and exciting night of music!